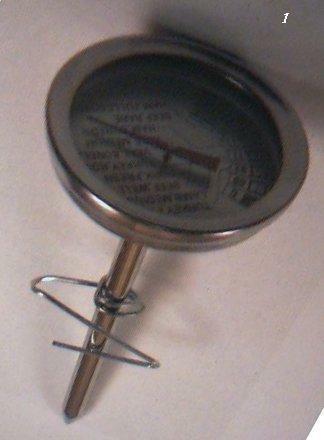 I used a Meat/Poultry Thermometer for measuring the temperature of the water in the top pot. It cost $1.99 from Big lots. Weight is 1.5 oz. One can bend a paper clip to hold it on the side of the bucket. See photo #1. The 5/16 distilled water output copper tube is about 4.5 long. Flare one end just a little bit and ream the ridge on the other end. Solder this in the side at a downward angle near the bottom of the pie pan. See photo #2. 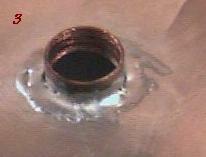 Center support tube: Cut a .75 in diameter by .25 to .375 long end from a copper pipe. This pipe solders slightly sticking up though the bottom of the pie plate. 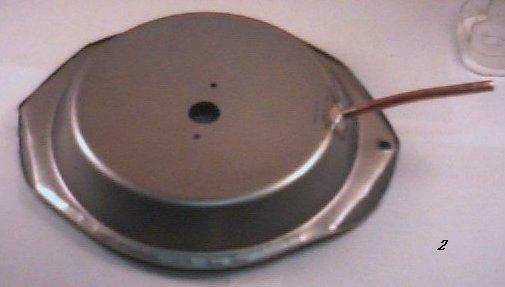 It could also solder to the aluminum lid instead if you have an aluminum welding rods. One could also hold it in place with silicon rubber sealer. In a pinch this part is optional depending on the following test. Check the amount of cone up in the center by adding water and seeing if it runs out the side tube or whether more height is needed. In my case I did it just for insurance. See photo #3. Use two 8-32 x .75 Machine round slotted head SS or brass bolts and nuts to hold the top lid of the bottom pot to the pie pan. Two holes are drilled near the center. See photo #4. A small washer is put between the lid and pie pan as a spacer to keep the fiber glass insulation from squashing completely flat. This step of bolting it together is optional and is not vital to its operation, but at least one bolt is necessary for holding the splash guard in the next step. It also makes the center unit easer to handle so that it can be removed as a unit each time the water is changed. One can purchase these parts at Home Depot. 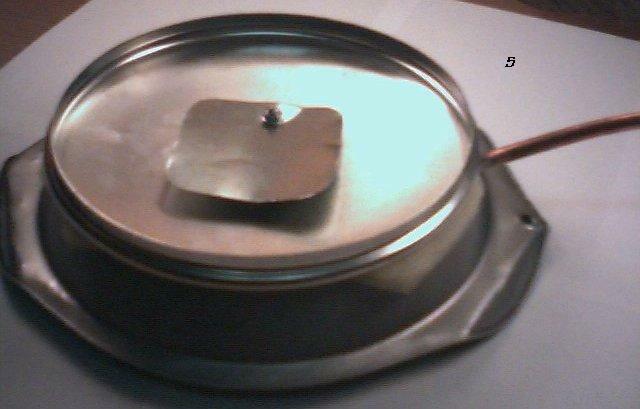 A 3.25 by 3.25 sheet metal plate with rounded corners is placed under the bottom lid to deflect the splatter of boiling water and keep it from going through the .75 hole in the lid. It is positioned to be at least a ¼ from the top to allow the steam to pass around it and out the hole in the top of the lid. Can use a peace cut out of a tin can. See photo #5. A small amount of thin fiber glass insulation was used to fill about .1 space between the lid of the bottom pot and the bottom of the pie pan. One can purchase this from Home Depot. This is used to minimize heat transfer from the bottom pot lid to the water that has condensed and is ready to run out of the Pie pan. This is an optional part that is not vital to operation.